One of the new handy features in Artweaver 4.5 is an automatic recovery of all opened documents after Artweaver has been unexpected quit. This feature is only activated in very rare situations when Artweaver crashes or hangs but then it is very helpful. 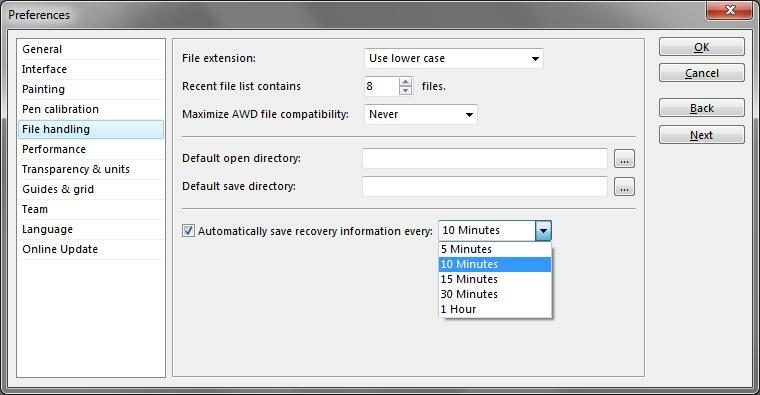 By default Artweaver saves the status (or more precise only its events) of all opened documents every 10 minutes but this can be changed in the application preferences to the own needs. Should Artweaver really stop working during editing documents, all opened documents from the last recovery information are restored on next Artweaver startup. This is completely done automatically by replaying all events of each document and after finishing a notification message is shown. Of course we are always working on improving the stability of Artweaver in every situation but on a crash / hang no more (big) work loss should happen with version 4.5 or later. We are happy to announce the availability of Artweaver 4.5 Free and Plus. 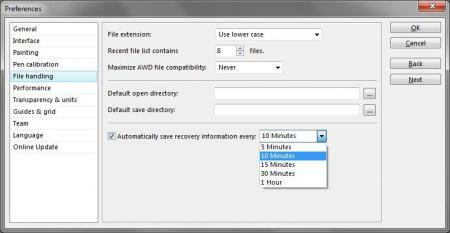 Artweaver 4.5 is an interim version of Artweaver 4 with some new features and many improvements of existing features. This update is free for all Artweaver 4 users and you will get this update automatically over the Artweaver self update feature the next days. We are happy to announce the start of the Artweaver 4.5 beta test. Artweaver 4.5 is the next update for Artweaver with many improvements of existing features and a better integration with Artweaver Team. Please register today for free to the Boris Eyrich Software Beta Portal or login with your already existing Artweaver Team account and join the Artweaver 4.5 beta test to learn more about the improvements and to get it. Maybe you have already noticed it that the whole website of Artweaver Team has been reworked. Together with a brand new design there are also some changes in the handling of Artweaver Team. The first and important one: You cannot longer login with your user name but now you have to use your email address as login. This change is only valid for the login and not for the password which hasn't been changed. The overview page which allows you to start, preview and stop your active session. It also shows you the recent sessions which can be directly managed from here. The session page where you can manage your current running session and also invite friends to it. It also shows you useful details about the session and invitations. The gallery page where all your stopped sessions are listed. You can manage each of them from here, see more details and also control if they should be visible in your personal gallery or not. The help page where you can get and search for help. It shows you besides a search field for the Knowledgebase the popular and latest articles. The profile page where you can edit and adjust your Artweaver Team account settings. Last but not least there is also now a complete German version of Artweaver Team available. It automatically detects your browser language and shows you the right language and also sens you emails in your preferred language. Note: If your Artweaver Team account is still in English and you want to change it to German you may need to update the language value in your profile. We hope you enjoy this new Artweaver Team and if there are any open questions, check out the help articles or contact us. An update for Artweaver Free and Plus 4 to version 4.0.5 is now available. You will get this update automatically over the Artweaver self update feature the next days.